A large memorial marks the grave of William Armstrong of Sorbitrees in the ancient border cemetery of Ettleton, Castleton. 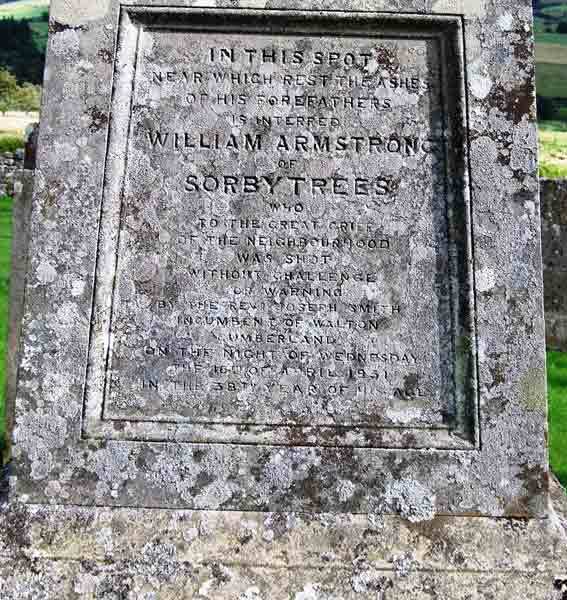 In April 1851 William Armstrong of Sorbietrees, a man on the right side of forty years of age, married with four children, rode to Brampton, on the English side of the Border, a market town of considerable antiquity, to conduct negotiations for the purchase of some property. It was market day and Armstrong soon met up with friends and acquaintances from his home lands, specifically the Elliots of Liddesdale. Business completed, on their way home, they passed the hostelry which is now Cambeck Cottages. Armstrong, high in spirit, determined to leave his travelling companion, Elliot, and ride up the lane to Walton. At the parsonage there worked one, Anne Glendinning, a lady fairly advanced in years: a friend and former employee of the Armstrongs of Sorbietrees. On reaching the parsonage, nigh on eleven o’clock, Armstrong was confronted with a quandary. Should he openly rap at the door at a time when most country folk, known for their early rising, would be languishing in the land of Nod, or should he, hoping that maybe the servants of the place were still up, tap at the window next to the main door. He chose the latter course. ..."To the great grief of the neighbourhood"
Next morning, early, the milkmaid, on approaching the parsonage, was astounded and terrified to find a dead man within the gate. The Rev. Joseph Smith was immediately summoned and openly proclaimed his guilt. Sixteen miles to the north and over the Border to Scotland, a wife and four bairns were beside themselves with worry as a result of the absence of a loving husband and father. Imagine their horror then when, from papers found in the dead man’s pocket and the identification of Anne Glendinning, they were eventually to learn of the extra-ordinary death of him whom they held so dear. Armstrong was buried in Ettleton cemetery; that he was well thought of and sadly missed is evident from the memorial that stands head and shoulders above all others in this ancient churchyard. 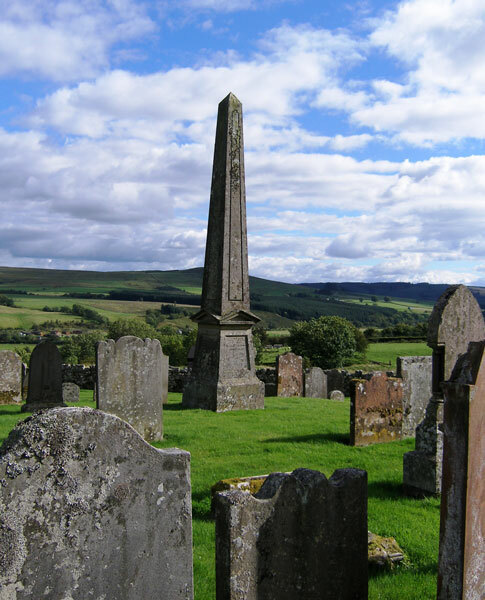 He is buried in the vicinity of the ashes of his fore-fathers, the men who ruled in Liddesdale for centuries: the men who were feared by all, be they Scots or English. And what of poor Joseph Smith, the incumbent reverend of Walton parish in north-east Cumbria? He was tried for manslaughter before the illustrious judge, one Baron Platt. The facts were easily determined yet Platt, from the onset referred to the defendant as the ‘reverend gentleman’ rather than the prisoner at the Bar. Baron Platt, in summing up said: ‘After weighing the evidence it is for you (the Jury) to say whether, upon the occasion referred to, Mr Smith, bona fide, believed robbers were about to attack his house. If a man so conduct himself by making noises at untimely hours as to cause the inmates of the house to believe that it is going to be broken into, it is precisely the same as if the burglary was committed; and no question a man has a right to go forth and alarm persons so acting, either by shooting over their heads or in the direction in which he fancies they are, to prevent the burglary’. The Reverend Joseph Smith was acquitted. It is said, though there is no evidence that it was so, that Joseph Smith and his family left Walton soon after his acquittal. It is not currently known whether a project has been undertaken to record the graves in Ettleton cemetery, so if anybody is aware of such an undertaking we would be keen to hear from you. We can be contacted via the comments section at the end of this post or the contact us button. ReiverHistory.co.uk – This article was written for us by Tom Moss. Author of “Deadlock and Deliverance“. The story of the capture and rescue of Border Reiver, Kinmont William Armstrong. Ettleton cemetery, Castleton -Location and information on this ancient border church or kirkyard which is the resting place of many Border Reiver families. Sorbietrees B&B Newcastleton – A popular place for visitors to the border region to stay.